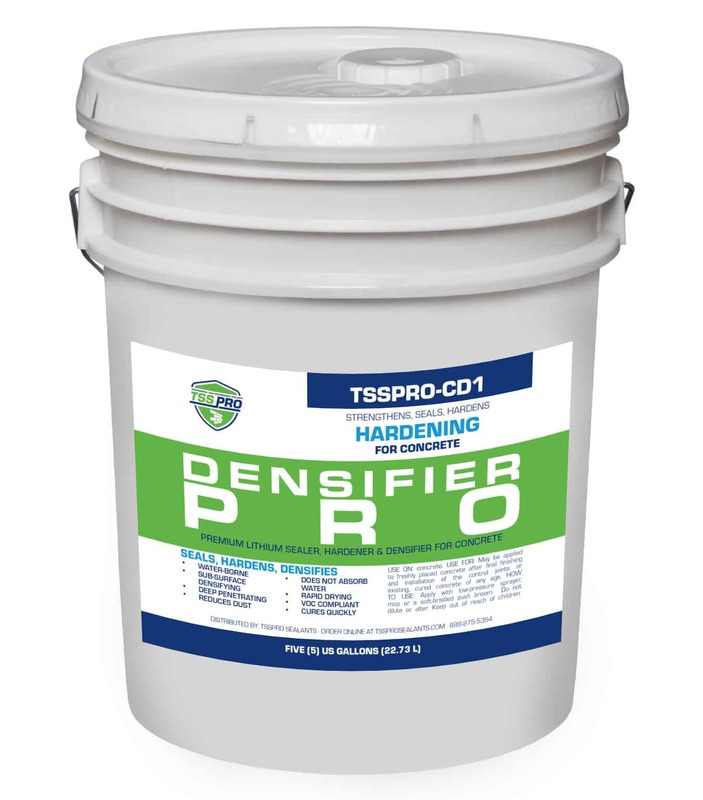 TSS Densifier Pro is a powerful water-based sealant for dramatically densifying and strengthening concrete and concrete products of any kind, and, unlike most sealants the results are permanent. Available only in 5 Gallon Pails. NOTICE: This product IS VOC compliant and available in all 50 states and Canada. NOTICE: This product IS VOC compliant and available in all 50 states and Canada. TSSPRO-CD1 reacts with concrete to produce insoluble calcium silicate hydrate within the concrete pores filling the voids and densifying the concrete. Only TSSPRO-CD1 is formulated to produce lower surface tension allowing it to penetrate easier and faster; in addition, significantly, TSSPRO-CD1’s proprietary blend of particle sizes allows it to both penetrate deep and also to react with the surface pores and capillaries which is the primary line of contact; as capillary pore space is filled the hardened properties of concrete are substantially improved. Lithium will not absorb water or contribute to floor sweating. TSSPRO-CD1 is safer, easier and faster to apply than conventional sodium or potassium silicate-based products. It can be applied with a low-pressure pump up sprayer, mop or a soft-bristled push broom. In addition to greatly increased surface hardness,TSSPRO-CD1 reduces dusting and simplifies maintenance producing a cleaner, healthier environment for years. TSSPRO-CD1 is VOC compliant. TSSPRO-CD1 should only be applied on concrete surfaces and products containing cement.